I’ve got a folder of bookmarks that are just screaming to be linked to from this blog. I know, I know, I told them it would do them no good in their google ranking but they insisted. This design for a holga inspired digital is beautiful. Simple clean and looks like it would be amazingly fun to use. If you’re not reading Letters of Note from time to time you must immediately remedy the situation. An ever growing collection of correspondence from all sorts of celebrities, historical figures and cultural icons. Some of my favorites include a reply to a fan from Steve Martin, Kurt Vonnegut’s letter home describing his time as a POW, and Bill Watterson’s letter announcing the end of Calvin & Hobbes. They update daily over there and its usually something interesting. 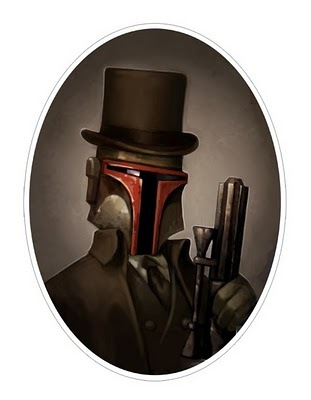 Artist Greg Peltz decided to do a series of victorian portraits with the characters of Star Wars. My favorite of course would be Boba. Not really a link but more of a recommendation, Karin and I watched and enjoyed Sunshine Cleaning tonight. Funny, very dark, but ultimately rewarding movie. Allan Arkin is of course wonderful playing the same irreverent grampa character he always does but it works for me. It was a slow news day at the homestead today which is good. Got some much needed housework done and since we had a nurse for the afternoon (Karin’s first break since Tuesday) so we spent it napping and relaxing and baking and going grocery shopping. It was nice. Liam is doing well even if he is a bit tired from yesterday’s festivities. Tomorrow the plan is to take Liam somewhere special for being such a well behaved boy throughout all of this activity. Narrowed down the choices but we haven’t yet decided so I’ll just let you know tomorrow when I will probably have some pictures to share. ← Why watch Boston Med when we can live it?